List of all the products used at the end of this post. Hello readers today I want to share the most common makeup look I have been doing this summer. For day or night, it is pretty easy to do and the colors and the textures used work perfectly with the summer weather. In the summer I don’t like to have too much on my eyes so I just use some concealer. I choose a color a little bit lighter than my skin tone to awaken my eyes. For my eyebrows I used a tinted eyebrow gel to keep them in place and add density. To protect my skin from the sun I used a SPF50 sun protection. As I have combination skin I used a primer to help my maekup stay in place longer. I put several straws of the stick foundation on my face and blended everything with my fingers. When the overall makeup look was done I applied some pressed powder with a brush and sprayed some fix/refreshing mist on my face to get a more natural finish. I applied a beautiful red/coral long lasting blush on the apple of my cheeks. This product is matte with some nice tiny gold particles which give a beautiful highlight effect. 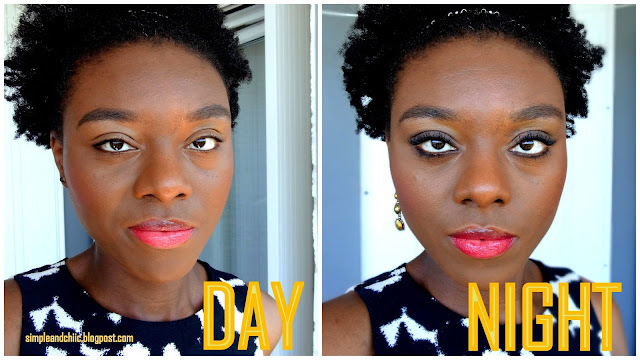 I applied one of my favorite summer lipsticks (see HERE). It is a lip balm which is very pigmented and very gentle on my natural very dry lips. For the day I apply this balm lightly for a natural result. I used a black waterproof eyeliner close to the upper lashes. To create a natural somkey eyes I decided to use a cream eyeshadow in a dark brown color on my lids. It also contains some bronzy shimmer which give a perfect result for a night look I think. To give more definition to my eyes I placed some eyeliner on my lower lashes I decided to use a brown eyeliner so the eye look does not look too heavy. I then used several coats of my 3 favorite mascaras on my lashes. I just added layers of the same lipstick. To upgrade an everyday look to a night look accessories are a must and can totally change your look. Here I added some touch of gold and bronze.